You are invited to get involved. Maybe you already have a case study of good practice to send us, or maybe you have access to a great project as yet undocumented. 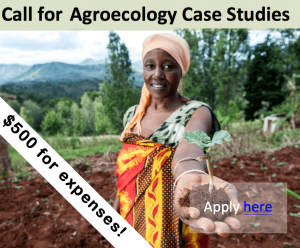 Maybe you have reports and photos that can help to show the benefits of agro-ecological approaches. Or maybe you need help to research and document an example of good practice. Support can be provided in the form of editing, design and up to $500 to help construct a quality case study. We can help you compile and share your case study, showing the many benefits in terms of food security, nutrition, poverty reduction, climate change adaptation and mitigation, biodiversity conservation, cultural sensitivity, democracy, justice, and value for money.